I’m in love with green bean casserole! Not any green bean casserole, however. Dish me up the classic green bean casserole invented in 1955 by Campbell’s Soup Company using canned ingredients and beware the dragon fire. As I’ve mentioned before, I like to use fresh ingredients and to build a dish from scratch. There really is nothing more satisfying, more delicious, more virtuous, more necessary. I realize that for some, the mere mention of the words scratch and dish in the same sentence will make you shriek , while you run as as fast as you can to the bathroom, curl up in your bathtub and chew on your shoes. Wait. No one else does that? Please don’t tell anyone I said that! Ahem. Back to the green bean casserole. First, I start by using the freshest green beans. If you must, use frozen green beans but please don’t go for the canned green beans. I beg you! I’ll come and do your laundry if that’s what it takes. Once I learn how to do mine, that is! I also like to make the o-so-important creamy bechamel sauce using a roux, which is a mixture of fat, usually butter, and flour. Of course, don’t forget to top it off with some crispy caramelized red onions. Because I’m nice like that 😉 I am also providing you with direction on preparing certain steps ahead of time so that you are able to incorporate it in your busy routines. Now that you’re mouth is watering, we can get started. Rinse the green beans well. Place them in a deep pot, cover with water and bring to a boil. Blanch them for no more than three minutes. Remove, strain and leave for later. You can do this step well ahead of time and then re-heat the beans in a little water when ready to serve. As soon as you put the beans on the stove, add the milk to a saucepan with the whole nutmeg, bay leaf, onions and smashed garlic. Bring the milk to a simmer and be sure to keep stirring so that it doesn’t burn. This shouldn’t take more than two to three minutes. Turn off the flame and let it sit to infuse about 15 minutes. After 15 minutes, remove all the ingredients from the milk. In a well buttered pan, add the mushrooms and cook on high flame for no more than a minute or so. Remove and strain. Add the butter (45g) in a heavy bottomed sauce pan and let it melt on medium-low flame. Now, add the flour (45g) and using a wooden spoon keep stirring till all is incorporated. You are going to keep stirring for about 2-3 minutes till the roux starts to froth and most of the flour flavor is cooked off. Now begin adding the strained warm milk a little at a time. About 1-2 tablespoons to start with and continuously stir. Switch to a whisk and keep adding the milk slowly, continuously whisking, adding more as the milk is incorporated. Once you’ve added all the milk, let the sauce cook for a further ten to fifteen minutes on low heat and keep stirring very often. Now, if you wish you can make the sauce a couple of hours ahead of time then you will need to keep it warm in a bain-marie. Add the sauce to a pyrex bowl and place over a pot filled with warm water. The sauce will thicken so just before serving add more warmed milk to it while whisking till desired consistency is reached. Remember to add the milk little by little. You can also cook the roux the night before, keep it in the fridge covered, then follow the rest of the steps about twenty to thirty minutes before serving. Make sure you start with a warmed roux. Now add salt and freshly ground pepper. The mushrooms. Be sure to warm them if you’re making this ahead. Now, drizzle the vegetable oil into a sautee pan and when the oil is hot, add the onion rings. Cook, stirring very often, till they are golden and crispy. 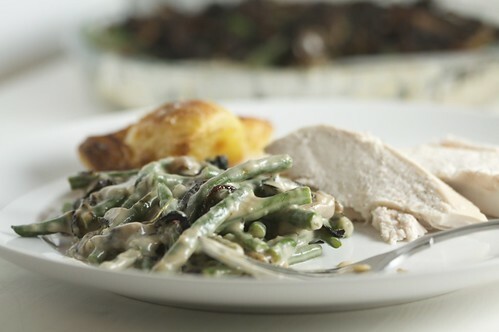 Lather the hot green beans with the bechamel sauce. Sprinkle with some parmesan if you like. And, then top with the crispy onions. Alternatively and if you are making certain bits ahead of time, you can add all the chilled ingredients in a casserole, add the bechamel sauce and then bake in a pre-heated oven 350F/160C/3G for about 10-15 minutes. Beth! Did you have to go and post this just before dinner? I’m starving and now I really want that casserole – it looks absolutely mouthwatering-ly divine! Comfort food! As ever you create what must be difficult presentation…look simple!. Bravo. Another winter warmer. I must yoga more!! Ohhh challenging dish to shoot 🙂 I’d be chewing on my shoes for less. Bravo! mmmmmm. looks and sounds yummy. fresh green beans are definitely key! I can’t thank you enough for posting this! I’ve been looking for a homemade, non-processed version of green bean casserole, and this is perfect. I’ll be making this next week for Thanksgiving! Looks lovely and I love béchamel but frankly give me loobieh b’zeit and I will take it instead anytime! That dish with the mushrooms and onions looks really good though! Thank you Chrissy! I really appreciate your feedback! Thanks Miranda 🙂 Do let me know how it goes. Enjoy! I can honestly say I have never tasted this casserole without Campbell’s. I bet it tastes fabulous with homemade bachemel sauce instead. And the crispy onions add a lovely touch. 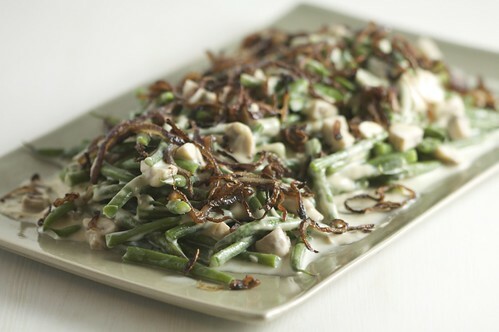 I was looking for a green bean casserole that did not involve cream of yuck, mushroom soup. Then I stumbled on your Samki Harra recipe. I was soo excited because my husband is from Tripoli. I’ve never been able to visit so thanks for adding the videos. I can’t wait to show him. I hope he can recognize the location it was shot at. Rachel- I’m glad you liked the video. I like your “cream of yuck” description. LOL 🙂 Hope you enjoy this version. Let me know if your hubby does end up recognizing the place. I made this yesterday for a pre-Thanksgiving dinner before me and my guy go to our families. 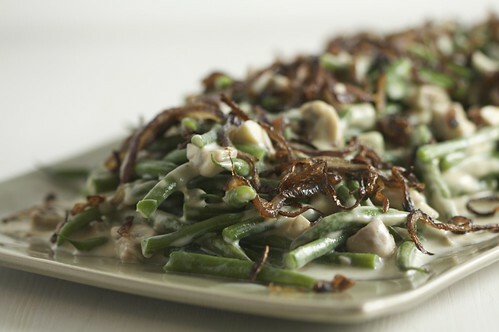 I love green bean casserole and he doesn’t really care for it…but this one got the thumbs up. Thank you!! I never think beyond steamed green beans with lemon butter and slivered toasted almonds. I have seen the error of my ways!!! Yum. I’m definitely the “run to the bathroom and chew on shoes” type and was made even more of one because all the measurements are in metric. AND if I was going to make this recipe, it needs to be for 12. Yiiiiikes! What does a non-foody, non-math-whiz do? And it looks delish, which does present a quandary! Yum! I missed this post then you talked about it and I had to come over and see for myself. Too delish! I so want to make this now! Next time I come to London we are coming for dinner and slumber party at your house! we invariably have lots of beans lying in the kitchen and i NEVER know what to do with em..this sounds fantastic..thanks for the recipe..will let you know hoe it turned out..